Success on guitar has little to do with natural talent and everything to do with mindset. Mindset is perhaps the most important factor in terms of long term success on guitar. As they say 'You have to first BELIEVE to ACHIEVE. The typical beginner guitar student will QUIT! The typical scenario goes like this. You get inspired, buy a guitar and start lessons. First lesson goes well as you are excited and enthusiastic about becoming a guitar player. You practices 10 minutes each day or until your fingers are sore. Second lesson goes okay but the level of enthusiasm has dropped ever so slightly By week 5 the honeymoon is over and it now feels like a chore. Many students concludes they are just not cut out to play guitar and besides life is too short to be wasting time practicing guitar. 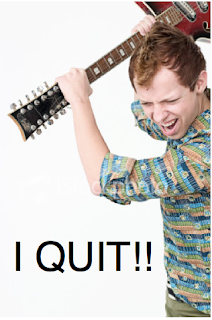 The best way to avoid the above scenario is to avoid being the typical beginner guitar student who quits due to a lack of motivation. Instead of allowing yourself to lose enthusiasm for guitar practice why not increase it instead. You can't be passive when it comes to motivation. You need to be actively looking for ways to not only stay motivated but to increase your motivation. Motivating yourself is actually a mindset. Its the mindset that says "I control how I feel." You can allow yourself to be tossed around like a boat with no sail on a turbulent ocean or you can take charge. Success on guitar starts with mindset and your mindset is a choice. Anyone can learn to play guitar but the ones who actually end up playing guitar are the ones who developed the right mindset. For ideas on how to motivate yourself check the following blog. *5 Ways to Inspire Yourself to Practice Guitar.